One of the more head-turning ads of the political cycle recently came from the independent expenditure group backing Republican Mike Dunleavy for governor, the confusingly named Dunleavy for Alaska. It features an interview with Sen. Bill Wielechowski that sure makes it sound like the Anchorage Democrat was one of Dunleavy’s best buddies in the Legislature (perhaps because Dunleavy was on the outs with fellow Republicans by the time he resigned). Wielechowski’s taken issue with the ad since it started running, putting up multiple posts on Facebook. Today he fired off a cease-and-desist letter targeting the campaign. Terre Gales, the chairman of Dunleavy for Alaska, dismissed Wielechowski’s letter when asked about it by the Associated Press, calling his demands frivolous. Dunleavy for Alaska is the group that’s done much of statewide campaigning in place of Dunelavy’s own personal campaign, putting out a mountain of those colorful—and familiar-looking—billboard signs. One of its key financial backers is Dunleavy’s wealthy financier brother Francis Dunleavy. It’s certainly true that Wielechowski and Dunleavy found common ground on the permanent fund dividend. At the start of the 2017 legislative session, the first session after Walker first vetoed half the PFD in light of the state’s financial troubles, both introduced legislation aimed at either protecting or returning the dividend. 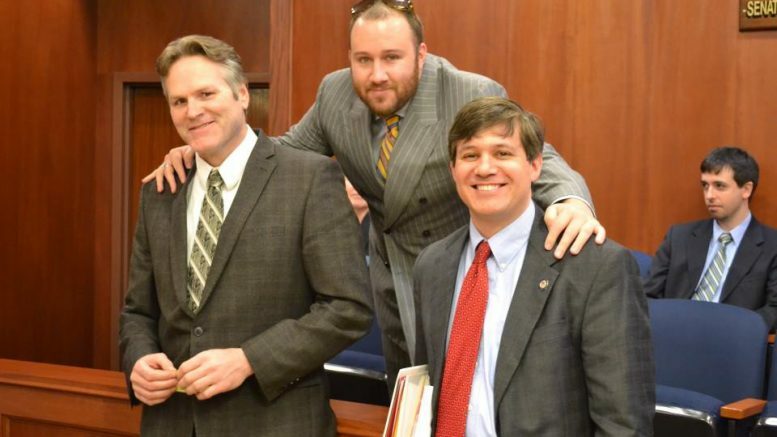 Dunleavy offered Senate Bill 1 that would have returned the vetoed money to Alaskans. Wielechowski authored Senate Joint Resolution 1, which would have asked voters to amend the Alaska Constitution to enshrine the dividend. Wielechowski leapt at the opportunity to help Dunleavy and signed on as a co-sponsor of SB 1, but the help wasn’t reciprocated. Dunleavy never offered his support to SJR 1 and even went as far as offering a tepid “no recommendation” when it came through committee. Both SJR 1 and SB 1 made it to the Senate Finance Committee before ultimately perishing, but not before some last-chance efforts made Wielechowski–and not Dunleavy. When Wielechowski tried to spring SB 1 from committee through a procedural vote, Dunleavy actually voted against the move (as did his running mate Kevin Meyer), falling in line with the Republican majority. He withdrew the legislation 10 days later. It’s one of six times that Dunleavy’s apparent best bud Wielechowski says the Wasilla Republican voted against the PFD. Wielechowski attempted to make the same moves with SJR 1 this year, successfully getting it jumped out of one committee before it stalled in another. Dunleavy wasn’t able to vote for or against those efforts because he had already quit the Legislature. Dunleavy’s made the PFD a core element of his campaign, but has seemed to soften his tone on the dividend lately. Telling the AP that he’s not sure it’s doable in the long term and that changes should be put to a non-binding advisory vote. Be the first to comment on "Sen. Wielechowski, a true PFD die-hard, sends cease-and-desist letter over chummy pro-Dunleavy ad"